Ingenious! Ikea Bookshelf for stash! 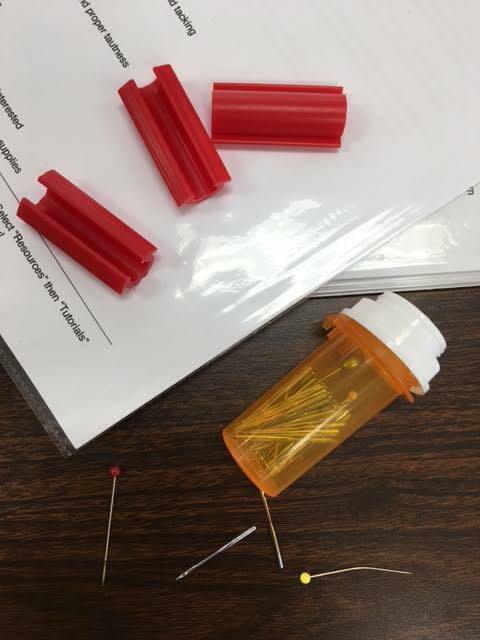 Pat Volk uses the inexpensive .49 cent school pencil holders from Walmart/Walgreens to store small items.The lables make it easy to know what is inside. 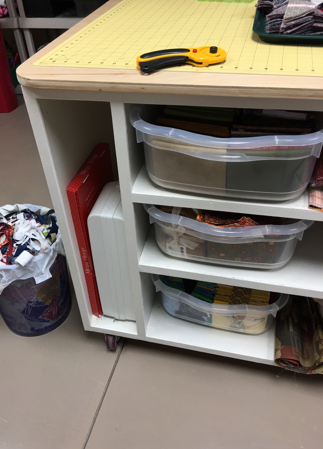 Pat Volk also uses tubs that she finds on sale to store fabric that is cut that might be used in other quilts. 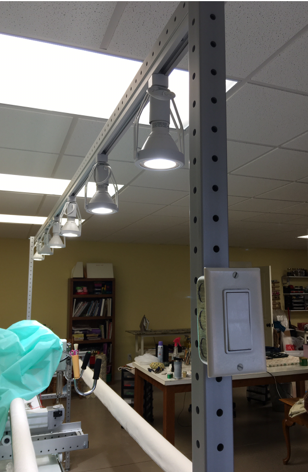 Tom Volk made it much easire for Pat to reach her on/off switch for her machine! See the button! 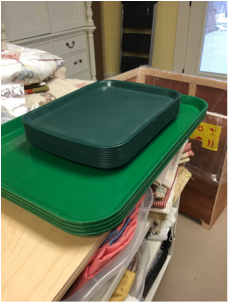 Pat Volk's husband found these simple plain green serving trays from a fast good restaurant at a garage sale. Pat turned them into a very organized way to lay out the pieces that you are cutting for your next quilt! 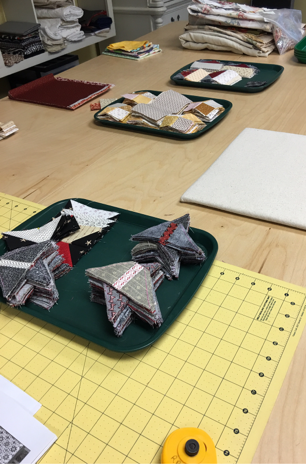 Once cut, the trays can be stacked one on top of the other or laid out while sewing so that you can easily reach the next piece to be sewn in. 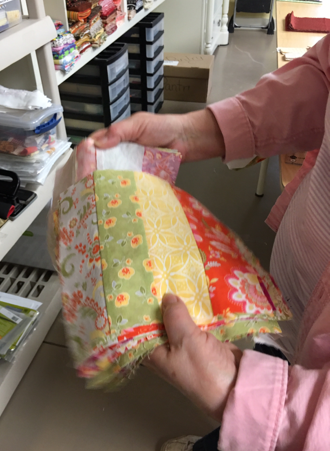 When Pat Volk finishes a quilt, she takes the scraps and cuts pieces and then pieces squares that can be picked up when needed to be added to a quilt. Furniture remake by Pat and Tom Volk. 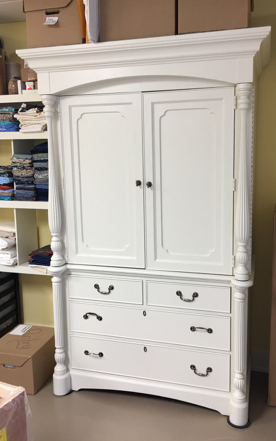 This was a piece of bedroom furniture that would not fit in their bedroom and would not be used. Pat painted it and re-purposed it into a storage cabinet. 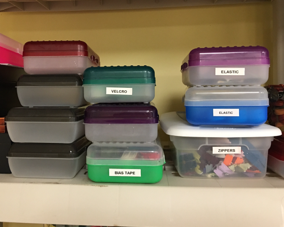 Inexpensive Underbed Tubs now into slide out drawers! 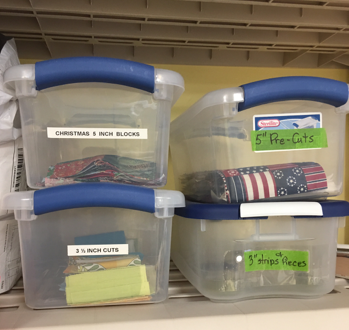 Pat Volk: Neat idea with pull out drawer storage. These are just simple under the bed bins without the tops and slid into the shelf area of the table that Pat's husband Tom built for her. Center of thread cone re-purposed! This one is a gem! 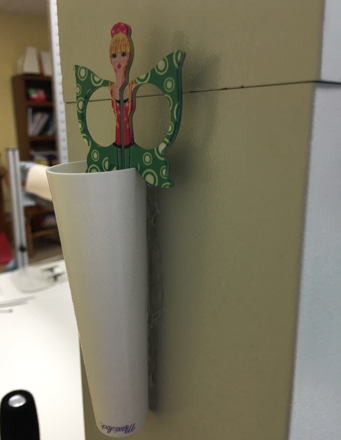 Pat took the center of a fabric cone, turned it upside down and hot glued a bottom into it so that things would not slide through and then hot glued it to the handles and back of her machine for scissor and brush storage! You don't even see the hot glue! 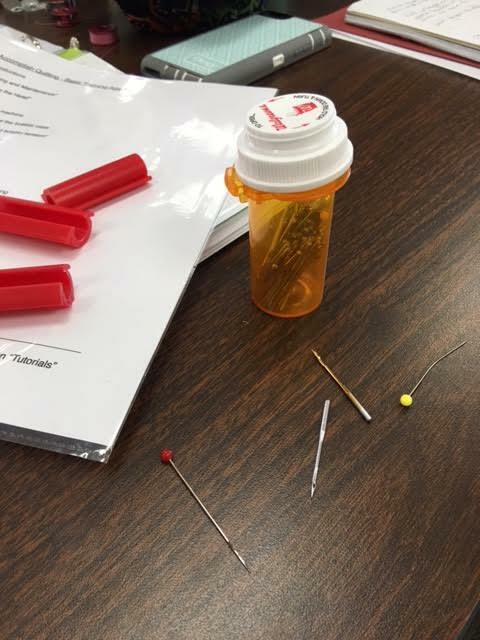 Ever wonder what to do with bent pins and used needles? ​Julie Lillo came up with this one! 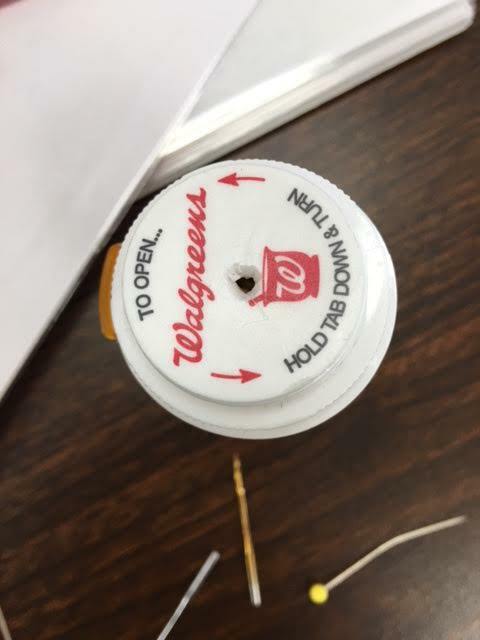 Take an empty medicine bottle and drill a hole into the top! 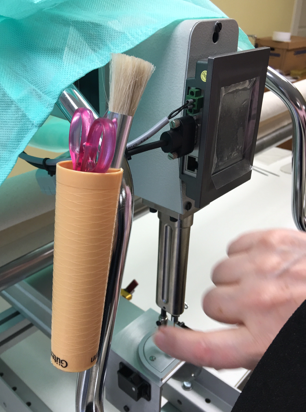 Make sure that the hole is large enough for the pin heads to slip through. 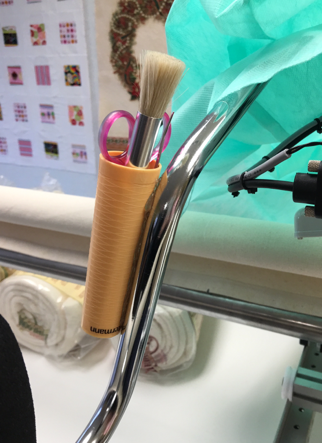 Now you have a handy way of disposing your used sharps!